I just had one of “those” days. This one was so bad, it started the night before and kept on going. Having had two weeks of broken sleep, hubby finally returned from his various trips and I scuttled off to the spare room for a good nights’ rest. Sod’s law dictated though, that as soon as I snuggled under the duvet, Poppy’s croupy cough crescendoed and I ended up bringing her in with me, thus my sleep-filled night was a snot fuelled fright, and s’not a lot of sleep was had. It was 5am and I was ready for my bed. We pulled back the morning curtains and searched for the sky, but the sun had put her hat on and marched off to another continent. It rained, it poured and the heavens snored thunderously. And being Dublin – where let’s face it, the rain reigns – no-one can cope and everyone and their dog got into their cars (including me!) and it took twice as long to drive as it normally does to walk, so we were late. But before the road rage there was an epic temper tantrum. Screaming and shouting and stamping of feet (that was me), wailing and crying and screeching (that was Daisy) and by 8.30 I was ready for the hills. We finally got to playschool and Daisy continued her recent phase of not wanting to stay. Poppy on the other hand cries because she wants to go and doesn’t understand she is too young. So I have Poppy in my arms screaming and holding onto Daisy, who is being restrained in her teacher’s arms, screaming and crying and holding onto Poppy. We tear them apart (my heart along with them) and we finally get the right one to stay and the right one to go. It’s 9.30 and I’m ready for a gin. I decide to head for Ikea to take half the shopping back from the last visit (I think it’s their marketing magic – you go for one thing, buy 20, take half back, but when you are there buy 10 more things, but end up having to take five back and the cycle continues until you are 90 and can no longer drive, but that’s another blog for another day.) Because it’s raining, it takes me an hour and when we get there (Poppy now trying to get herself out of the car seat in protest) I discover it doesn’t open until 11. I have to pick Daisy up at 12 so I literally turn around and head back to school. It’s 10.30 and I’m ready for retirement. When we get home, I can’t even give them their usual half hour TV (my crucial half hour switch off) because in the midst of our respective tantrums this morning, I threatened Daisy with no TV today and now have to carry it out. It’s only mid-day and I’m ready for a breakdown. With the mood inside as dark as the skies outside, I decide to abandon all plans to cook, and clean and write. When the pieces aren’t falling into place, sometimes we just need to figure out the puzzle, so I sat down on the floor with my girls and a jigsaw. We ended up doing 21. Yes, 21! And with each one completed our smiles got a little wider and our moods a little lighter. We talked and laughed and eventually our bad moods lifted. I’ve run myself ragged over the last two weeks trying to do fun things, go to new places (art gallery a DISASTER), and I realised an important thing today. Like the proverbial Christmas present, kids often just want the box. In this case, me. At the end of our jigsaw marathon, I asked Poppy if she was tired. “No. I’m ‘appy”. It’s the end of the day, and I’m ready for that gin, but now, it’s in that “Phew, what a good day” sort of way. 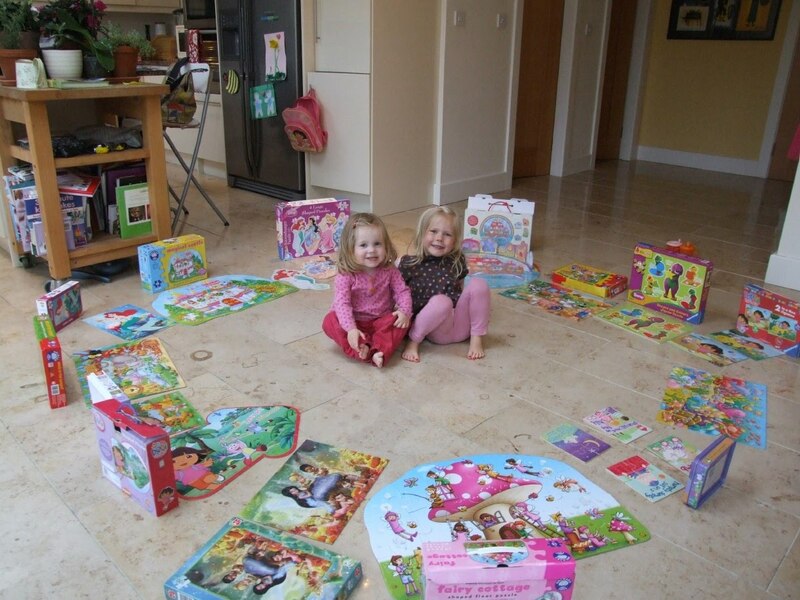 This entry was posted in disasters, jigsaws, motherhood. Bookmark the permalink. don't you just love when a rotten day turns around?